In the spirit of sharing past gifts, here is a super quick, cheap and simple DIY gift idea that is perfect for a stocking stuffer: an action figure louffa. Full disclosure--this gift has "inside joke" written all over it. But sticking a macho superhero on a fluffy louffa cloud is pretty awesome at any age, so no need to tell you the "you kinda had to be there" story. Just enjoy the superhero goodness. 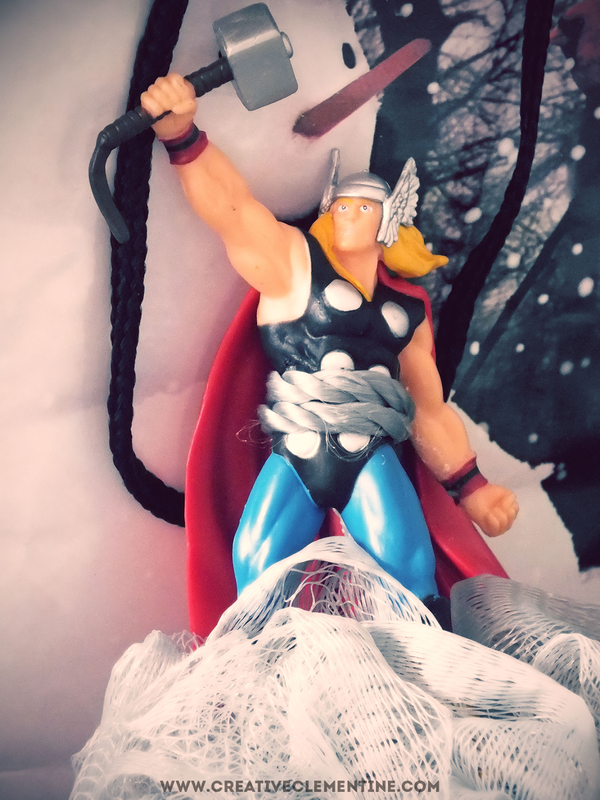 I found a cheap Thor action figure in the toy section at a department store and superglued it to a louffa. Whabbam! That's really it. There are more photos of this project than steps required to actually make it. That right there is my kind of DIY project! 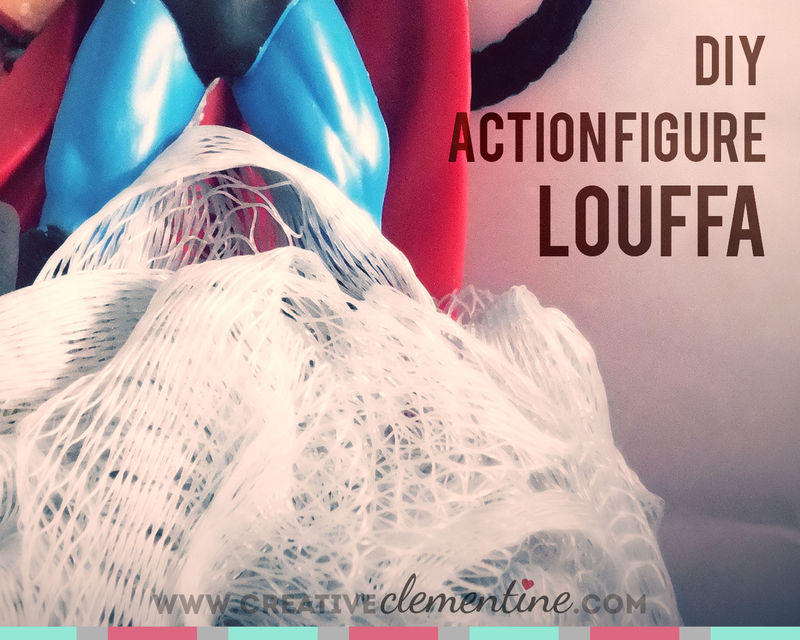 Position your action figure on the louffa as desired, wrapping the rope of the louffa around its body. 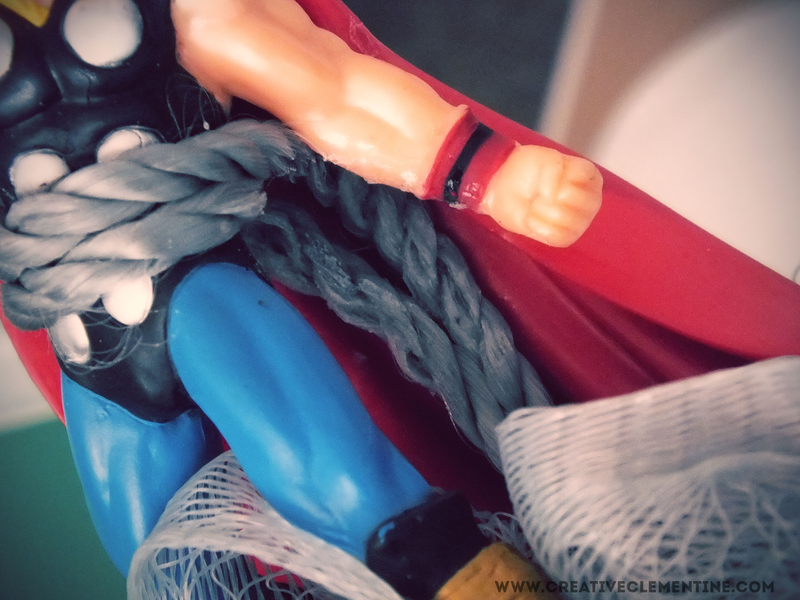 Apply a generous amount of superglue to the louffa string/action figure. Hold the rope in place while the glue dries. Let sit for 24 hours before use/gifting, or follow instructions on the glue package for drying/wait times. I told you it was easy! Happy Monday. this is hilarious. Pretty sure a friend of mine would love it as well! So fun. Thanks for sharing it on Merry Monday. I've featured this in a diy christmas roundup. This is great! My daughter always wants the lufas with the characters on them, but they never have the one she wants! Now I can make it for her! Perfect! Thanks for sharing at Totally Terrific Tuesday! Happy New Year! Unplug the tree--today is all about ME!